I was about to be a teen parent when I enrolled in the Healthy Families Mississippi (HFM) program through the DHS office. My biggest motivation for joining the program was to have support after I give birth. Becoming a new mom is scary and I wanted all the materials I could have to ensure a healthy pregnancy. 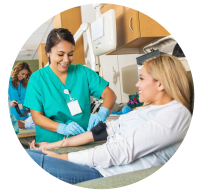 After I enrolled in HFM, I made a goal to become a phlebotomist and began phlebotomy courses after giving birth. HFM helped me to get back to school by offering child care assistance through the Child Care Payment Program. I have since then completed all my courses at Mississippi Delta Community College and work full-time as a phlebotomy tech at Greenwood Leflore Hospital. Below you will find the working draft of Mississippi’s Division of Early Childhood Care and Development’s State Plan for FY2019-2021. Please be aware that the State Plan is subject to change before it is finalized and submitted. We welcome your comments and suggestions and encourage your attendance at the second public hearing on August 18, 2018 from 10 a.m.-12 p.m. at Two Mississippi Museums. We look forward to your participation and input. State Early Childhood Advisory Council of Mississippi provides counsel to the governor on issues related to young children and their families. SECAC is comprised of experts in education, health care, child welfare, and mental health and serves as the central meeting place for all stakeholders in Mississippi’s early childhood system, including the early care and education workforce, parents, and the general public. Healthy Families Mississippi is a new home visiting program serving pregnant mothers and parents with children less than 3 months of age in Copiah, Claiborne, Coahoma, Humphreys, Holmes, Issaquena, Jefferson, Neshoba, Sunflower, Sharkey, Tallahatchie, Tunica, Washington and Wilkinson Counties. Link families to community services and resources. Provide child development, nutrition, financial and safety education. Refer families to other support services. If you would like more information on how we can help you or someone you know, please complete a referral form.